STAR POP vintage + modern's 3rd Anniversary Party! 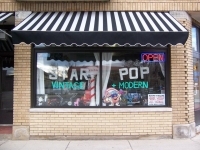 STAR POP vintage + modern, in Cleveland's Waterloo Arts District, is turning three! Come celebrate three years of recycling pop culture, and saving the planet; on Saturday August 11, 2012 6-9pm with cake, prizes, drawing, and a dragon! In addition to eating cake and winning fun prizes, STAR POP vintage + modern wants to see you exercise your creative side, so during the anniversary party, Leia Alligator, of Picklefight Puppets, will be encouraging kids of all ages to draw pictures inspired by some of their favorite toys, clothing, music, movies, video games, books, and art.